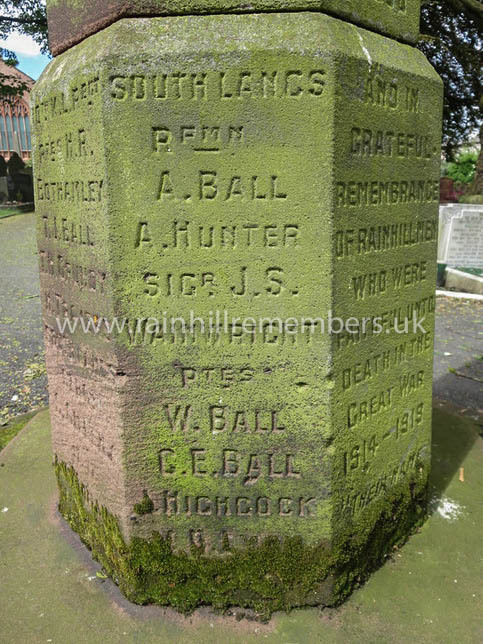 WWI Memorial in St Ann's Churchyard with the name of Private W. Ball inscribed on it as a soldier of The South Lancashire Regiment. Born in 1885 Walter lived first with parents Thomas & Mary and four siblings John (21), George (12), Albert (10) & sister Elizabeth Birchall in Holt Lane. Elizabeth’s husband James was also living there. (48), & Thomas Kenwright Junior (15), his cousin Austin Birchall(16) staying at the same address. It is in this year that Walter marries Catherine Turton at St.Mary’s Parish Church, Prescot. After enlistment and a period of training, Thomas was sent to France on 13th February 1915. Sadly less than three months later he was injured and died of his wounds on Wednesday 5th May 1915 age 31. He is commemorated on the brass plaque in St. Ann’s Church, the war memorial in the churchyard and the Cenotaph in Warrington Road. Walter is buried at Hazebrouk Communal Cemetery.